It is important to test your home or a home you are looking to buy. Since Radon is produced from rocks, soil, and water….it is more prominent in the North Georgia and the Atlanta area where it is a more mountainous region. 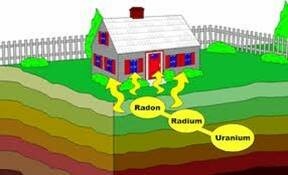 Radon is a poisonous gas resulting when Uranium breaks down to a gas, Radon is produced. The gas can seep through cracks and holes of home foundations. All homes do have some radon in them, but it is imperative to know if the levels are elevated to critical levels and is toxic to your family. If you are looking to purchase a home, you should have you home tested by a certified Georgia Radon Inspector, especially in the Dekalb, Fulton, and Gwinnett county areas as they are known to have elevated radon levels. Since you cannot see, taste, or smell radon gases, the only way to know what a structure’s radon level is to have it professionally tested. The Surgeon General suggests having radon tested every 2 years since soil configurations can change over time and building joints can open over time allowing gases that the soil produces to bypass the structures mitigation system. A radon inspection is a simple procedure where a short-term test (48 hours) is performed in the home. A detector will be set-up where it will take hourly readings. Please note that the testing area site must not be disturbed during the test. Mill Creek Environmental will provide a report of the average reading and indicate if there are any elevated radon levels detected. If there is a radon issue, a certified contractor will need to be contacted to address the situation. It is a best practice to have the inspector to be separate from the radon removal contractor. Why Is Radon A Big Issue? If enough radon gas is inhaled over an extended period, it can cause lung cancer. This is the leading cause of lung cancer in non-smokers. Per US EPA, nearly 1 out of every 15 homes in the United States is estimated to have an elevated radon level. In fact, all federally-backed mortgages will require radon testing before closing in the near future. Are There Any Symptoms of Radon Gas Exposure? Basically, there are not short-term health symptoms that indicate radon exposure. After years of radon exposure, you will start to have the same symptoms similar to those found in lung cancer caused from smoking. Those symptoms include a persistent cough, coughing up blood, shortness of breath, fatigue and recurring infections. Don’t leave your family open to invisible dangers….get your radon test done today! Call today to schedule your radon test!